While Charleston is best known for its stunning historical architecture, another captivating feature of the Holy City is its spectacular harbor. 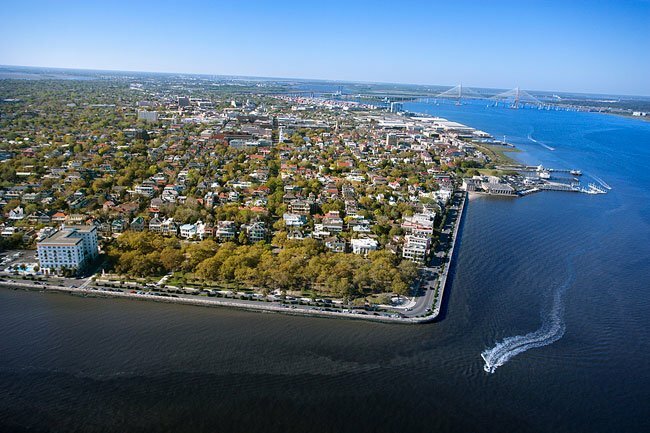 Formed by the confluence of the Cooper and Ashley rivers, the Charleston harbor attracted early settlers to relocate from present-day Charles Towne Landing to White Point Garden, then known as Oyster Point, in 1680. The colony declared the harbor the colony’s port of entry in 1682. The harbor is also where the Civil War began, with militia troops at Fort Johnson firing the war’s first shot onto Union-occupied Fort Sumter at the harbor’s entrance. On May 13, 1862 Robert Smalls, as a slave, commandeered the Confederate transport ship, The Planter, out of the harbor disguised as the boat’s captain. His family and other slaves aboard the ship sailed out of the harbor to their freedom. Smalls later served five terms in the United States Congress. The harbor, with a natural depth of 12 feet, is also where the Confederate submarine, the H.L. Hunley, successfully attacked the USS Housatonic on the night of February 17, 1864. The Hunley was the first submarine to sink an enemy ship. The crew of the Hunley sank after the attack, killing all eight crewmen. The Hunley was discovered on the floor of the harbor in 1995, though another claim, which is unsupported by the courts, that the submarine was discovered in 1970 makes the initial discovery date controversial. The vessel was recovered on August 8, 2000 and is now on display at the Warren Lasch Conservation Center in North Charleston. Prior to the Civil War, the Rivers and Harbors Act of 1852 permitted dredging the channels of the harbor to a depth of 17 feet. However, the war interrupted the project, which was not completed until 1895. While the resulting jetties that now flank the entrance to the harbor allow for the entrance of large ships, they are also blamed for the erosion of nearby Folly Beach. Today the harbor has been dredged to a depth of 45 feet. A plan to further deepen the harbor’s channels to 52 feet to allow the entrance of post-Panamax ships began in 2015 by the United States Army Corps of Engineers. The Charleston harbor is vital to the economy of South Carolina with the State Ports Authority operating five public terminals. It is one of the most productive ports in the country, and shipping remains one of South Carolina’s top industries. 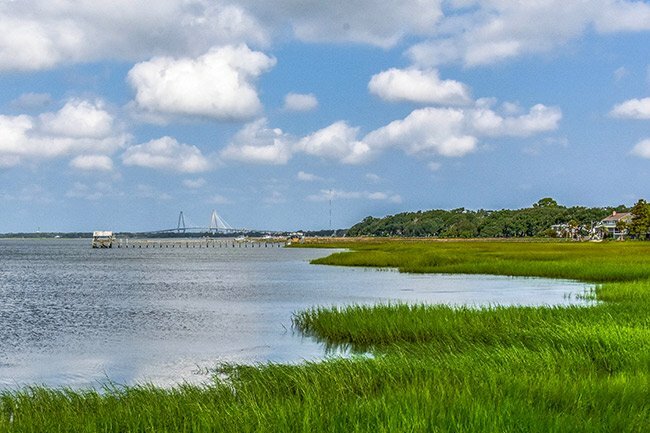 The harbor is also a popular recreational site, with marinas, yacht clubs, cruise ships, the South Carolina Aquarium, and the annual Charleston Maritime Festival all making their home on Charleston’s waters. 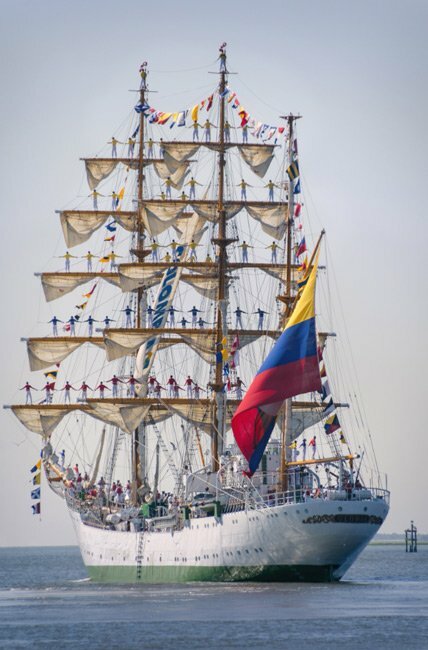 The Gloria, a visiting tall ship from Colombia, is seen departing the harbor during the 2016 festival in the above photo. 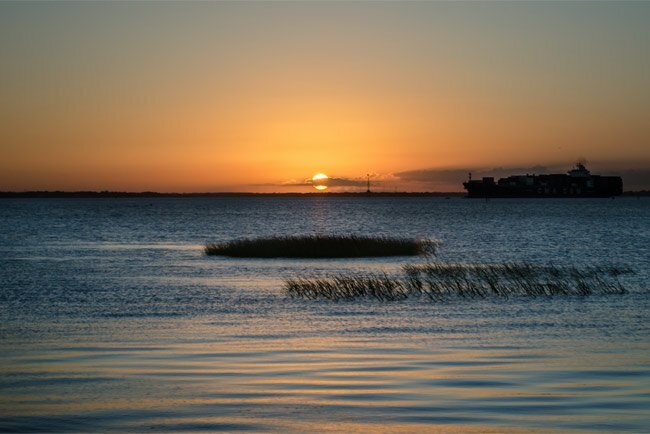 Other gems – both natural and manmade – give life to the harbor, such as Castle Pinckney and Crab Bank Seabird Sanctuary. 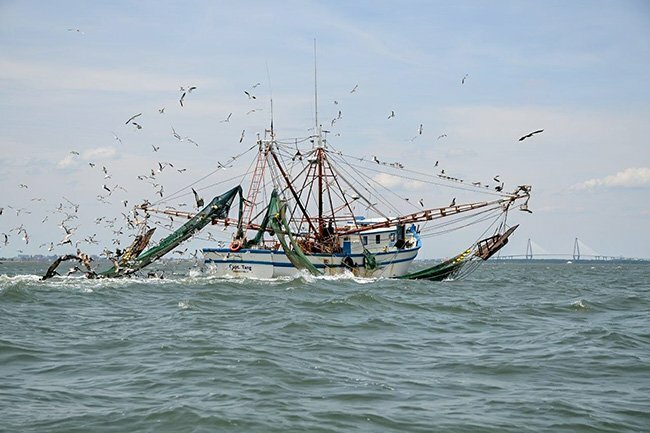 With forts and sand banks, barges and sailboats, history and business, and people and wildlife, the beating heart of Charleston can be found within the living waters of its harbor. Wow..what a beautiful ship! I was on board La Liberdad but El Gloria is more beautiful, and elegantly rigged. Congratulations, and happy sailing.